Now the fact this is titled as a 'haul' isn't strictly true. My brother in law and his girlfriend came to visit and brought me a gift. This made me smile for so many reasons, not just because it was a load of lovely Lush products. I won't go into it but it made me very happy. BUT they were spot on and if I had decided to treat myself I would have picked up most of these. They picked very very well! 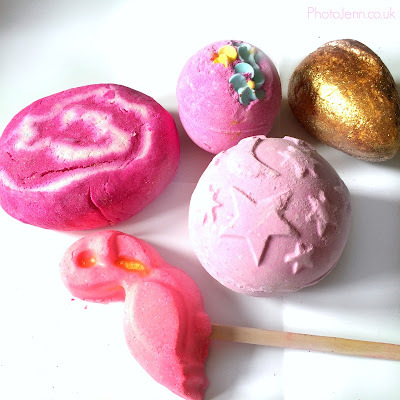 When it comes to Lush, for me you can't go wrong with anything pink and as you can see they picked mainly pink products - they all smell incredible! I wanted to share a little about the bits they bought me. Now how cute is this? A little pink flamingo on a stick, what's not to love?! I let Mason use this a couple of times and he loved mixing it around the bath creating the bubbles. I was a little unsure at first as I bought him an 'Iclke Baby Bot' before and he got rather upset as he saw the robot fizz away into the water. It was a rather dramatic moment. But he was fine with this, maybe he feels less attached to the flamingo, I don't know. You run it under the tap while the bath fills and will it around using the stick and the bubbles appear. It left the skin soft and smelling gorgeous. You can't beat a good bubble bar and the Comforter doesn't only smell great but it's a good size too. I make this last 4 or 5 baths. It's fruity and sweet yet calming, is full of lovely soft bubbles. You know the drill. This one is a staple in any Lush collection. This one is so glittery! -it gets everywhere. When glitter enters your life it never truly leaves (not necessarily a bad thing, I admit). 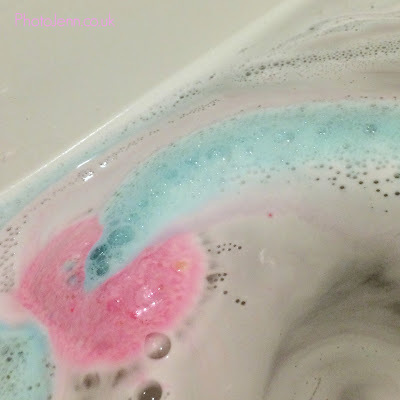 Once in the bath the glitter disperses and it leaves your bath the colour of an unhealthy wee - there's no other way to describe it! Try not to concentrate on that and focus on how soft the cocoa butter and olive oil leaves your soft skin. The scent is sweet but not sickly and I was worried I'd be really sparkly afterwards but there wasn't actually a lot to show for the glitter side of things if I'm honest. Think Pink is one of my favourites. It's one of the cheaper bath bombs so I never feel bad about treating myself to this one. 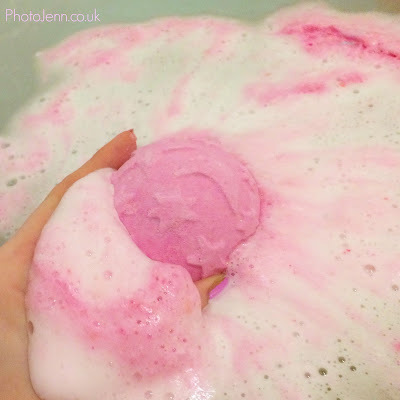 This little pink bath bomb looks so cute with it's pretty flowers - very Spring-like! Lush describes the scent as 'cheerful and calming' which is perfect. It's a bit candy-like but has a touch of lavender which really soothing. You get a great surprise (which I'm aware I am ruining a tad for you here!) in the middle, as it dissolves it fills the bath with little red hearts. Adorable. It's designed to help you sleep and full of lovely calming essential oils. This is one I like to go for when I'm really run down and need time to properly relax and switch off. All-in-all a gorgeous bag of treats that made my day. You just can't go wrong with Lush. Now that I've used them all up I need to take another trip. Feel free to leave your suggestions, I'd love to hear about your favourite Lush products.